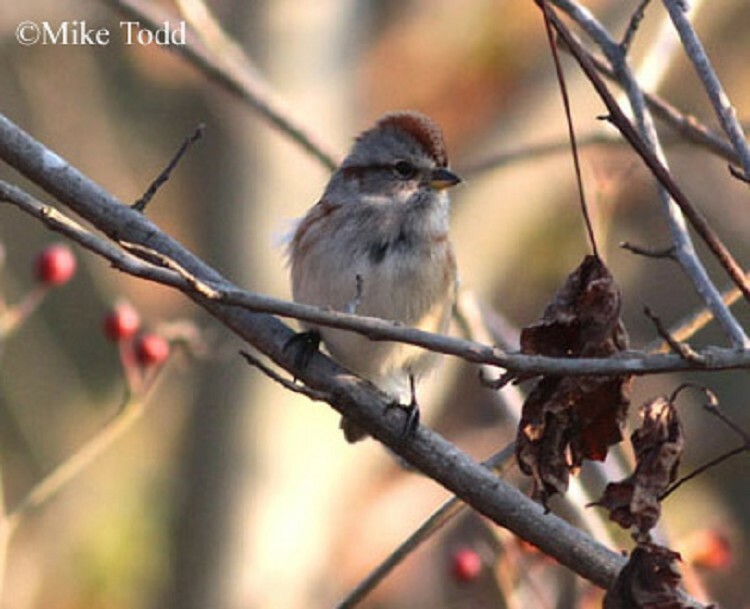 American Tree Sparrows are irregular winter visitors to Tennessee, and are more common some winters than others. The northern and western portions of the state are typically the southern limit of the wintering range, but in years when there is poor seed production up north, more birds may "invade" Tennessee. They have an extensive breeding range that reaches across northern Canada and Alaska, and despite their common name, American Tree Sparrows forage on the ground, nest on the ground, and breed primarily beyond treeline. American Tree Sparrows are typically found in Tennessee from late October until mid-March. Description: The most distinctive features of this small songbird are the rusty crown, and dark spot in the center of the unstreaked breast. It has a rounded head, a rusty eye-line, a gray stripe over the eye, two white wing-bars, and a rather long tail. Males and females look the same. Voice: The song is a series of thin, high, sweet whistled notes, not often given in winter. The call is a hard tseet. Chipping Sparrows are smaller, have no central chest spot, and have a black (not rusty) eye-stripe. In winter the crown is brown with faint streaks. Field Sparrows have a plain face, a thin white eye-ring, a bright pink bill, and lack a central chest spot. Song Sparrows have a dark central chest spot, but have streaks on the chest, and dark mustache marks. Habitat: Breeds in open scrubby areas near treeline. Winters in brushy fields, marshes, gardens, open forests, and residential neighborhoods. Diet: Insects in summer, seeds and berries in winter. Status in Tennessee: The Tree Sparrow is an irruptive species. It is found in the northern, middle, and western counties most winters, but can occur in flocks statewide during irruptions. It generally arrives in late October and departs by mid-March. Despite its common name, the American Tree Sparrow feeds, and nests on the ground. A recent study found that American Tree Sparrows watch for predators out of their left eye. Apparently the right brain hemisphere processes more visual information. Interestingly, the same study found that Dark-eyed Juncos prefer to watch out of the right eye. Best places to see in Tennessee: Yards, feeders, and open grassy areas with woody shrubs and/or forest edges statewide. Naugler, C. T. 1993. American Tree Sparrow (Spizella arborea). The Birds of North America, No. 37 (A. Poole, P. Stettenheim, and F. Gill, eds.). The Academy of Natural Sciences, Philadelphia, PA, and The American Ornithologists' Union, Washington, D.C.